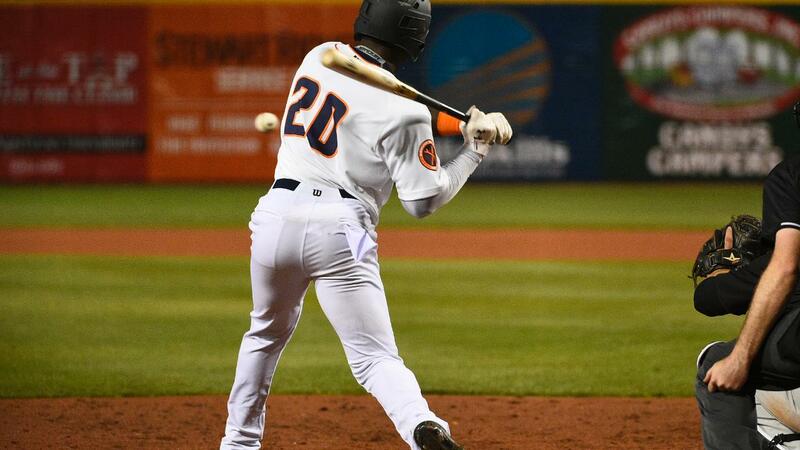 Eastlake, OH- The Bowling Green Hot Rods out-hit the Lake County Captains in a 2-1 loss on Thursday night in the final game of a four-game set at Classic Park in Eastlake, OH. The Hot Rods fall to 3-5 and will begin a six-game home stand and three-game series against the Fort Wayne TinCaps on Friday evening with a 6:35 PM CDT first pitch. Lake County took the first lead of the night in the bottom of the first inning. Jose Fermin singled to center against Hot Rods starter Joe Ryan and stole second base. Fermin advanced to third on a ground out by Will Benson and scored when Josh Rolette singled to left, giving the Captains a 1-0 lead. Lake County added to their lead in the third with Ryan still on the mound. Fermin doubled to left while walks to Bo Naylor and Rolette loaded the bases. Mitch Reeves grounded a ball to third, but an errant throw to second allowed a run to score with Lake County taking a 2-0 edge. The Hot Rods halved the deficit in the sixth to chase Lake County starter Raymond Burgos from the game. Connor Hollis led off with a triple to right after serving a ball deep to Will Benson, who fell down. With one out, Grant Witherspoon singled to drive home Hollis and cut the Captains' lead to a run at 2-1. Bowling Green's bats fell silent until the top of the ninth innings, still trailing by a run. Kaleo Johnson led off the frame with a walk, moving to second on a passed ball. With one out, Roberto Alvarez reached on an infield single and both runners moved up a station with two outs on a wild pitch. With two strikes, Tony Pena grounded out to third, ending the threat and the game with the Hot Rods falling to Lake County 2-1 in the series finale. Ryan (0-1) took the loss after he allowed two runs on five hits with three walks and three strikeouts over 4.2 innings of work. Chris Muller made his Hot Rods debut, throwing 3.1 hitless, scoreless innings in relief while allowing a walk with three strikeouts. Notes: Smith had his second multi-hit game of the season… Witherspoon tied Chris Betts for the team-lead in multi-hit games with his third… Thursday was the Hot Rods' first loss when outhitting an opponent… They're 3-1 in that scenario… The team is 1-4 when the opposition scores first… The five hits allowed by Ryan tie a career-high… The three walks also tie his career-mark… When Bowling Green scored in the sixth, it snapped a 16.1-inning scoreless streak… Alvarez and Johnson have three-game hit streaks… Hollis became the third Hot Rod with a triple, joining Wander Franco and Bryce Brown… Bowling Green was 2-for-16 with runners in scoring position… The Hot Rods return to Bowling Green Ballpark on Friday to take on the Fort Wayne TinCaps with a 6:35 PM first pitch… It's a Firework Friday at Bowling Green Ballpark, with post-game fireworks after the conclusion of the game presented by Norton Children's Hospital… It's BG Bubble Night at Bowling Green Ballpark… Bowling Green will send LH Michael Plassmeyer (0-1, 1.50) to the mound against TinCaps LH Joey Cantillo (0-0, 4.15)… Fans can catch all the action with Shawn Murnin on Willie 107.9 FM, as well as, with their smart phones via the MiLB First Pitch app and TuneIn Radio app.